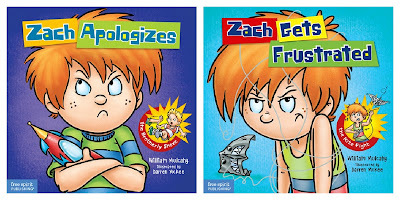 A family counselor and psychotherapist teaches kids how to tame their frustration and how to deliver a proper apology in the first two books of the newly released Zach Rules series. 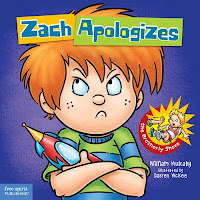 From the Publisher: In Zach Apologizes, when Zach shoves his little brother to the floor, he knows he did something wrong. Even so, it's hard to apologize - especially when he feels Alex kind of deserved it! With his mom's help, Zach learns the "four-square" apology: (1) say what you did; (2) say how it made the other person feel; (3) say what you could have done instead; and (4) make it up to the person. Why It's On My Bookshelf: Coaching students when it comes to an apology is so important. Otherwise we'd probably just hear a lot of quick "I'm sorry's." We know that kind of apology does more harm than it does good. Reading Zach Apologizes reopened my eyes to how absolutely critical it is to help kids go deeper when they are making amends. Author William Mulcahy introduces kids to the "four-square" apology. This approach helps kids to be remorseful and have empathy about their actions. Kids are very visual so this is really going to stick with them. Cannot wait to teach this to the students and staff! Plus the kids play four-square out at recess so their ears will REALLY perk up. Make sure to read the WONDERFUL advice in the back of the book for adults. There are some great tips on how to guide children through the four squares. Download a printable copy of the four-square apology HERE. From the Publisher: In Zach Gets Frustrated, Zach is having a lousy day at the beach. Zach kicks sand, yells angry words, and asks his dad if they can just go home. Instead, his dad teaches him the "frustration triangle" - a simple, three-step approach to get a handle on frustration: (1) name it; (2) tame it; and (3) reframe it. Each book concludes with a short note to adults to help parents, teachers, counselors, and other grown-ups reinforce the book's messages and practice the skills with their kids. Why It's On My Bookshelf: This is SUCH a helpful resource to the students in my school. So many kids don't know what to do with their frustration and often times this leads to a negative behavior choice. 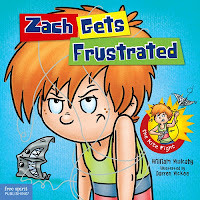 Zach Gets Frustrated teaches children frustration doesn't need to ruin their day and it can even be channeled into something positive if they take the time to understand it. The frustration triangle technique is a new discovery for me and it's going to definitely have an impact. I CANNOT RECOMMEND THIS SERIES ENOUGH! IT'S AWESOME!!!! !